For other uses, see Alexandra of Russia. Alexandra Feodorovna (Russian: Алекса́ндра Фёдоровна; IPA: [ɐlʲɪˈksandrə ˈfjɵdərəvnə]), born Princess Charlotte of Prussia (13 July 1798 – 1 November 1860), was Empress consort of Russia. She was the wife of Emperor Nicholas I, and mother of Emperor Alexander II. Charlotte was born the eldest surviving daughter of Frederick William III of Prussia, and Louise of Mecklenburg-Strelitz. Her childhood was marked by the Napoleonic wars and the death of her mother when she was twelve years old. In 1814, her marriage was arranged for political reason with Grand Duke Nicholas Pavlovich of Russia, the future Tsar Nicholas I. They married on July 1, 1817. Upon her marriage, Charlotte converted to Russian Orthodoxy, and took the Russian name Alexandra Feodorovna. Ideally matched with her husband, she had a happy marriage that produced a large family; seven children survived childhood. At the death of her brother in law, Tsar Alexander I of Russia, in December 1825, Alexandra’s husband became the new Russian emperor. Alexandra enjoyed her husband’s confidence in affairs of state, but she had no interest in politics other than her personal attachment to Prussia, her native country. She was the obedient and admiring supporter of her husband's views. Her personality was completely overshadowed by Nicholas I's strong character. As empress consort, Alexandra Feodorovna had no interest in charity work. Her chief interests were in family affairs, dancing, balls and jewels. After 1841 her health deteriorated. She spent long sojourns abroad in search for a respite to her frail constitution. As she became largely an invalid, Nicholas I took mistresses, but Alexandra retained her husband's love. She survived Nicholas I by five years and died in 1860. Charlotte was born at the Charlottenburg Palace in Berlin. She was the eldest surviving daughter and fourth child of Frederick William III, King of Prussia, and Duchess Louise of Mecklenburg-Strelitz, and a sister of Frederick William IV and of William I, German Emperor. The princess's childhood was marked by the Napoleonic Wars. Her father was a kind, religious man but a weak and indecisive ruler who, following military defeats in 1806, lost half of his kingdom. Charlotte’s mother was considered more decisive than her husband. When the Prussians were defeated at the battle of Jena, Louise fled to Königsberg, taking her children with her, Charlotte then being eight years old. In East Prussia, they were given protection by Tsar Alexander I. Soon, Berlin fell under Napoleon’s control and Charlotte grew up in war-torn Memel, Prussia. In December 1809, Queen Louise finally returned to Berlin with her children, but after a few months, became ill and died at the age of 34, shortly after Charlotte’s twelfth birthday. For the rest of her life, Charlotte treasured her mother’s memory. 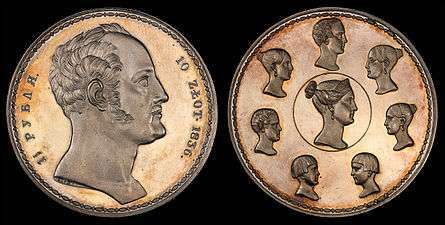 In the fall of 1814, Grand Duke Nicholas Pavlovich, future Tsar of Russia, and his brother Grand Duke Michael Pavlovich, visited Berlin. Arrangements were made between the two dynasties for Nicholas to marry Charlotte, then fifteen years old, to strengthen the alliance between Russia and Prussia. Nicholas was only second in line to the throne, as the heir was his brother Grand Duke Constantine Pavlovich who, like Tsar Alexander I, was childless. On a second visit the following year, Nicholas fell in love with the then-seventeen-year-old Princess Charlotte. Nicholas was tall and handsome with classical features. The feeling was mutual, "I like him and am sure of being happy with him." She wrote to her brother, "What we have in common is our inner life; let the world do as it pleases, in our hearts we have a world of our own." Hand-in-hand, they wandered over the Potsdam countryside, and attended the Berlin Court Opera. By the end of his visit, in October 1816, Nicholas and Charlotte were engaged. They were third cousins as great-great-grandchildren of Frederick William I of Prussia. On 9 June 1817 Princess Charlotte came to Russia with her brother William. After arriving in St. Petersburg she converted to Russian Orthodoxy, and took the Russian name "Alexandra Feodorovna". On her nineteenth birthday, 13 July [O.S. 1 July] 1817, she and Nicholas were married in the Grand Church of the Winter Palace. "I felt myself very, very happy when our hands joined," she would later write about her wedding. "With complete confidence and trust, I gave my life into the hands of my Nicholas, and he never once betrayed it." At first, Alexandra Feodorovna had problems adapting to the Russian court, the change of religion affected her and she was overwhelmed by her new surroundings. She gained the favor of her mother-in-law, Maria Feodorovna, but did not get along well with the Empress Elizabeth Alexeievna, consort of her brother-in-law. "I was very weak, very pale and (they claimed) very interesting-looking", she recalled later. Pregnant with her first child, Alexandra traveled to Moscow where, on 29 April [O.S. 17 April] 1818, she gave birth to her first son, the future Tsar Alexander II. The next year, 18 August [O.S. 6 August] 1819 in Krasnoye Selo, she had a daughter, Grand Duchess Maria Nikolaevna. That summer, Tsar Alexander I announced privately to Nicholas and Alexandra his intention of eventually on abdicating during his life time and that Nicholas would succeed him since their brother Constantine intended to marry morganatically. In 1820 Alexandra delivered a stillborn daughter, which brought on a deep depression. Her doctors advised a holiday, and in the autumn of 1820 Nicholas took her to see her family in Berlin, where they remained until the summer of 1821, returning again in the summer of 1824. They did not come back to St. Petersburg until March 1825 when Tsar Alexander I required their presence in Russia. Alexandra Feodorovna spent her first years in Russia trying to learn the language and customs of her adopted country under the tutelage of the poet Vasily Zhukovsky, whom she characterized as being "too much of a poet to be a good tutor." The Imperial family spoke German and wrote their letters in French, which was widely spoken at the Russian court, and as a consequence, Alexandra never completely mastered the Russian language. Alexandra Feodorovna wrote in her memoirs of her first years in Russia, "We both were truly happy only when we found ourselves alone in our apartments, with me sitting on his knees while he was loving and tender". Nicholas nicknamed his wife "Mouffy". For eight years, during the reign of Tsar Alexander I, the couple lived quietly. Tsar Alexander I had no surviving children and his heir, Grand Duke Constantine Pavlovich, renounced his succession rights in 1822, making Nicholas heir to the throne. In 1825 the Tsar gave Alexandra the Peterhof Palace, where she and Nicholas lived. It would remain her favorite summer residence. Alexandra was tall, slender with a small head of refined features. Her blue eyes were set deep in her head. She had an air of regal majesty. Her quick, light walk was graceful. She was frail, often in poor health. Her voice was hoarse, but she spoke rapidly and with decision. Alexandra Feodorovna was an avid reader and enjoyed music. Her favorite Russian writer was Lermontov. She was kind and liked privacy and simplicity. She dressed elegantly, with a decided preference for light colors, and collected beautiful jewels. Alexandra loved dancing and was particularly skillful at the mazurka enjoying court balls until dawn. Neither arrogant nor frivolous, Alexandra was not without intelligence and had an excellent memory; her reading was quite extensive; her judgment of men sure, slightly ironical. However, she took no active interest in politics and fulfilled the role of being an empress consort, rather than being active in the public sphere. She loved her family very dearly, and even developed facial tics whilst fearing the Decembrist Uprising and its plans to kill her family. The facial tics were a trait that ran in the royal German-Russian-British family in many branches. For her, Russia was summed up in the person of her beloved husband. By forcing his will on this fragile, irresponsible and delicate creature, Nicholas destroyed Alexandra’s individuality. Her husband gave her no time for reflection, for giving herself a sustained occupation, other than adoring wife and devoted mother. 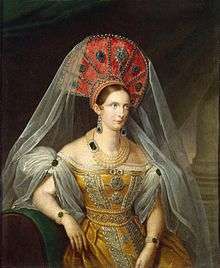 Alexandra Feodorovna became Empress consort upon her husband's accession as Tsar Nicholas I on December 1825. It was a turbulent period, marked by the bloody repression of the Decembrist revolt. By 1832 Nicholas and Alexandra had seven children whom they raised with care. In 1837, when much of the Winter Palace was destroyed by fire, Nicholas reportedly told an aide-de-camp, "Let everything else burn up, only just save for me the small case of letters in my study which my wife wrote to me when she was my betrothed." After more than twenty-five years of fidelity Nicholas took a mistress, Barbara Nelidova, one of Alexandra's ladies-in-waiting; the doctors had forbidden the Empress from sexual activity due to her poor health and recurring heart-attacks. Nicholas continued to seek refuge from the cares of state in Alexandra’s company. "Happiness, joy, and repose - that is what I seek and find in my old Mouffy." he once wrote. In 1845, Nicholas wept when court doctors urged the Empress to visit Palermo for several months due to poor health. "Leave me my wife." he begged her physicians, and when he learned that she had no choice, he made plans to join her briefly. Nelidova went with them, and though Alexandra was jealous in the beginning, she soon came to accept the affair, and remained on good terms with her husband's mistress. Alexandra Feodorovna was always frail and in poor health. At forty, she looked far older than her years, becoming increasingly thin. For a long time, she suffered from a nervous twitching that became a convulsive shaking of her head. In 1837 the Empress chose a resort in the Crimea for a new residence. There, Nicholas ordered that the Palace of Oreanda be built for her. She was only able to visit the palace once however; the Crimean War began in 1852. Towards the end of 1854, Alexandra Feodorovna fell ill, and came close to death, though she managed to recover. In 1855 Tsar Nicholas I contracted influenza, and he died on 6/18 February. Alexandra Feodorovna survived her husband by five years. She retired to the Alexander Palace in Tsarskoe Selo, and remained on good terms with her late husband’s mistress Barbara Nelidova, whom she appointed as her personal reader. The Dowager Empress's health became more and more fragile with the years. Unable to spend the harsh winters in Russia, she was forced to make long sojourns abroad in Switzerland, Nice and Rome. She wrote in September 1859 "I am homesick for my country and I reproached myself for costing so much money at a time when Russia has need of every ruble. But I cough and my sick lungs cannot go without a southern climate". After returning from a trip abroad in July 1860 she did not cease to be ill. In the autumn of 1860, her doctors told her that she would not live through the winter if she did not travel once more to the south. Knowing the danger, she preferred to stay in St. Petersburg so that she might die on Russian soil. The night before her death, she was heard to say, "Niki, I am coming to you." She died in her sleep at the age of sixty-two on 1 November 1860 at the Alexander Palace in Tsarskoe Selo. ↑ Grunwald, Tsar Nicholas I, p. 289. ↑ Letter from Alexandra Feodorovna to Meyendorff in September, 1859. Grunwald, Tsar Nicholas I, p. 289. ↑ NN Romanova 1820 in: geni.com [retrieved 3 August 2016]. Wikimedia Commons has media related to Alexandra Feodorovna (Charlotte of Prussia).